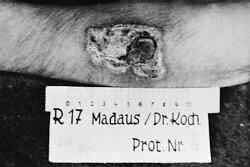 From about November 1943 to about January 1944 experiments were conducted at the Buchenwald concentration camp to test the effect of various pharmaceutical preparations on phosphorous burns. These burns were inflicted on experimental subjects with phosphorous matter taken from incendiary bombs, and caused severe pain, suffering, and serious bodily injury. The defendants Genzken, Gebhardt, Mrugowsky, and Poppendick are charged with special responsibility for and participation in these crimes. Source:U.S. Holocaust Memorial Museum. Trials of War Criminals before the Nuremberg Military Tribunals under Control Council Law No. 10. Nuremberg, October 1946 - April 1949. Washington D.C.: U.S. G.P.O, 1949-1953.